shut up and scrap: woohoo it's CC time!! the place where i share my madness! 2012 scrap challenge retreat february 24th-26th. 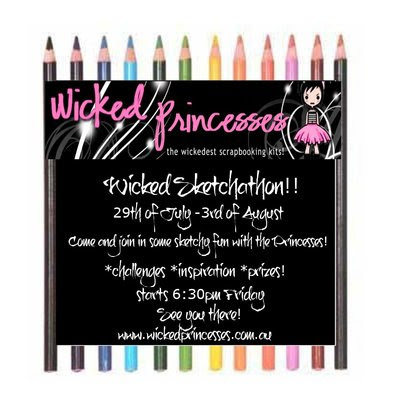 this weekend it is Cybercrop time at wicked princesses so make sure you head on over there friday night to kick start a weekend FULL of scrappy goodness and inspiration!!! you really won't want to miss it!!! SUNDAY WORKSHOPS: all sunday workshops are made up of three scrapping classes and therefore is discounted because they are done all in one day......all product for the layouts created, lunch, nibblies and drinks are supplied..The cost for the full day is $55....total bargain! should you choose to pre-pay then i discount it to $50....if you choose to commit to 6 months of classes and pay up front then you do six classes but only pay for 5! that's right one month free!!! tell a friend about my classes and bring them along to join in the fun and you will BOTH receive a free gift to add to your scrappy stash. SHOULD YOU BOOK INTO A CLASS PLEASE BARE IN MIND THAT ONCE I HAVE ORDERED THE KITS YOU ARE COMMITTED TO PURCHASING THAT KIT. I ORDER ALL THE KITS ROUGHLY THE LAST WEEK OF EACH MONTH. WHEN YOU BOOK IN I WILL ADD YOUR NAME UNDER THE CLASS SO WE CAN BOTH KEEP TRACK. I will post each months theme or colour scheme next to each class to give you an idea of whats coming up as they are organised but these may have to be changed around a little from time to time due to stock availability. SEPTEMBER: SUNDAY 25TH...this month the Amazing Ali Abernethy will be using an awesome kit created with the "zoology" range from Bo Bunny.....great for Zoo, outdoorsy or boy pics! NOVEMBER: SUNDAY 20TH...Designer Gorgeous Krissy Christie!! DECEMBER: Scrumptious Sandy will be our designer this month and she will be creating pages using the gorgeous Fnacy Pants range "Baby Mine"
Krissy (opt 1) ...fully paid. Ali (opt 2) $100 paid. READ WHILE I'M ALIVE......sleep when i'm dead! the goodness just keeps coming! !